Located just 1 block off of historic Route 66, the Dobson Museum is operated by the Ottawa County Historical Society. The museum hosts more than 5,000 historical items of the areas finest Native American artifacts, china, glassware, an extensive jug collection, area mining display, early day and foreign woodworking tools, displays of furniture and toys used by first settlers. The Dobson is also home to a native tee-pee that is on display at the museum. All the artifacts are owned by the Ottawa County Historical Society and highlight past Ottawa County life. Miami has a rich history that includes mining, military, Native Americans, famous residents. Citizens such as B.F. Goodrich, who has a permanent exhibit at the Dobson Museum. The Dobson Home was built in 1915-16 and is an extension of the museum. It is open for tours and is also available to rent for events, such as meetings or conferences. The Dobson family furniture remains in the house today. The Dobson Home is listed the National Register of Historic Places. 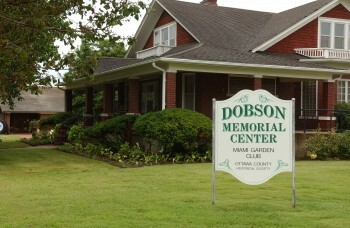 The gardens at the Dobson Memorial Center surround the home and are continued in the museum courtyard. From spring through fall, there is a steady show of color from the many perennials and annuals in bloom. The Miami Garden Club and volunteers from the Ottawa County Historical Society maintain the many beds. Visitors are encouraged and welcome to stroll through the gardens. The museum is located at 110 A. Street SW. The Dobson Museum and Home is open Saturday, Sunday, Wednesday, and Friday from 1 to 4 p.m. Special arrangements can be made for group tours by calling in advance. For more information or to schedule group tours, please call (918)-542-4435.